Imagine an environment where business decisions drive application choices and policy, with no regard for infrastructure, where best practices are implemented based solely on business requirements—and a “guaranteed service level” means just that. The IT of the future will be an elaborate business operation unencumbered by past technology decisions, one capable of providing exact service levels to multiple constituencies while continually optimizing costs. In this environment, IT will evolve into an even more valuable “weapon” for the business, with the ability to react quickly and cost-­-effectively, to deliver a seamless user experience and become a true digital enterprise that leverages digital technology as a competitive advantage in its internal and external operations. 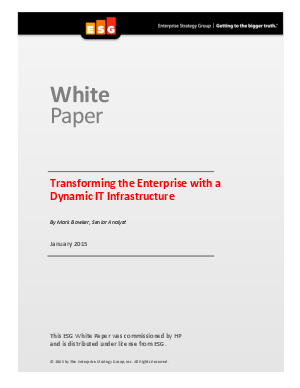 Download this white paper to learn about the benefits of integrating the various layers of infrastructure to transform your organization. ?Sponsor: HPE and Intel® processor. Intel and the Intel logo are trademarks or registered trademarks of Intel Corporation in the U.S. and/or other countries.